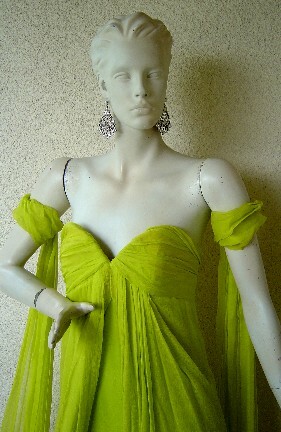 Circa 1960's Norman Hartnell strapless lime silk chiffon dress gathered and draped over slightly boned bodice, the skirt columnar, with multiple layers, gathered front draped panels falling from waist; complimented with unattached arm streamers of long drapey silk chiffon. Double closures; zipper corset closure and additional zipper closure on outside. 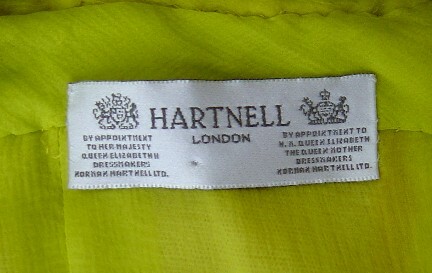 Hartnell's career in designing extravagant and opulent fashion for London society started with Lucile. He went on to open his fashion business in London in 1923, designing lavish grand evening costumes that appeared bigger than life. His ability to create fashions fit for royalty allowed him to receive a commission to design for the royal family of England.